This outstanding aircraft was in fact the only new fighter design to enter service with the Luftwaffe during the war. The prototype flew in June 1939 and after an intensive development programme in which both vee and radial engines were trialled, the Fw 190A entered production with a BMW 801 radial engine. The 40 Fw 190A-0 pre-production aircraft were followed by 100 Fw 190A-1 fighters, and the type entered service in the autumn of 1940. 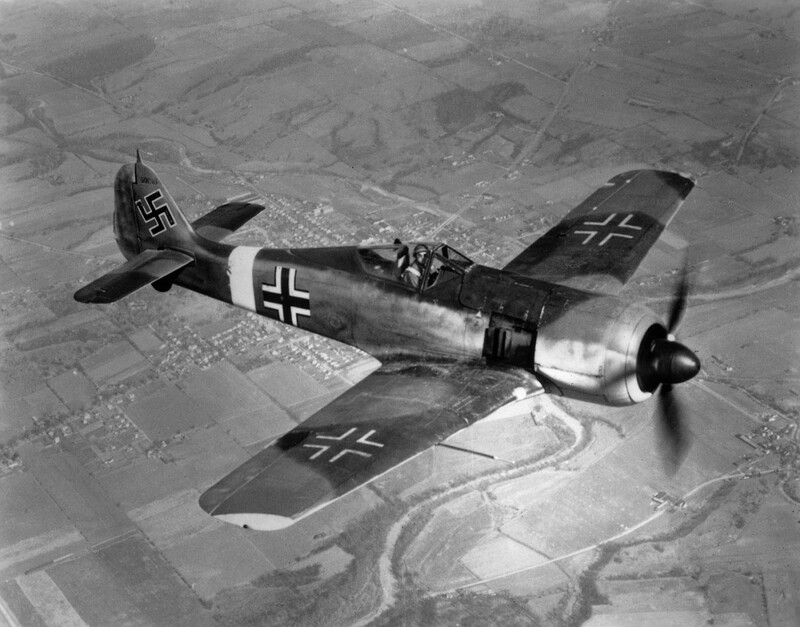 Although well known to the Allies prior to the war, the Fw 190 caused a nasty shock when it was first encountered over France in May 1941. It was light, manoeuvrable, fast, powerfully armed and immensely strong. The A-1 was followed into service by the longer-span Fw 190A-2 with heavier armament, the Fw 190A-3 fighter-bomber with revised armament and Fw 190A-4 fighter-bombers with a methanol/water power boost system. There followed a profusion of different versions, and although the aircraft was substantially better than virtually all of the versions of the Spitfire, the Fw 190 never supplanted the Messerschmitt Bf 109 in production. As development of the aircraft progressed it was used increasingly in the fighter-bomber role and gained heavier armament, strengthened landing gear and numerous different engine fitments.